In this episode of JEDI REACTS! : Drama, excitement…awkward conversations about the name Man-Ape, and a surprise crash at the end of the video. 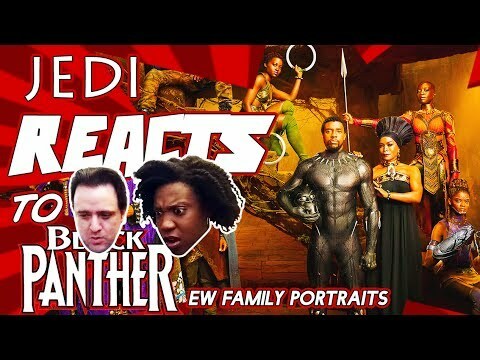 In the spirit of previous JEDI REACTS!, where Mrs. Digital Jedi reacted to early photos of Supergirl’s Superman, we react to never before seen photos released by Entertainment Weekly of the “Black Panther” family. T’Challa, Nakia, Okoye, Shuri, Ramonda, W’Kabi and Zuri, M’Baku and Erik Killmonger all make an appearance. JEDI REACTS! was brought to you, in part, by the low prices on Amazon. (*wink* Amazon *wink* Sponsorship *wink*…I don’t know how this works. SOMEONE SPONSOR ME!) Black Panther was brought to you, in part, by a couple of white guys who are really, really, genuinely sorry about colonialism. And a black director who said, “I’ll take it from here, guys.” By the way…this movie. EPIC. Period.